As we grieve the loss of Sydney Monfries, we recognize how important it is for us to be together. We gather to console each other, to remember Sydney, and to celebrate her life. In consultation with various members of the community, including United Student Government, we will be holding two services in her honor. The first, on Tuesday, April 16, at 8:00 PM, will be held in the University Church and Terrace. It will be planned and led by members of the student body. We invite everyone, of all faiths and commitments, to join us. For those based at Lincoln Center who are interested in attending, free Ram Van service will be provided. Please reach out to Conor O’Kane at cokane3@fordham.edu to reserve a seat. 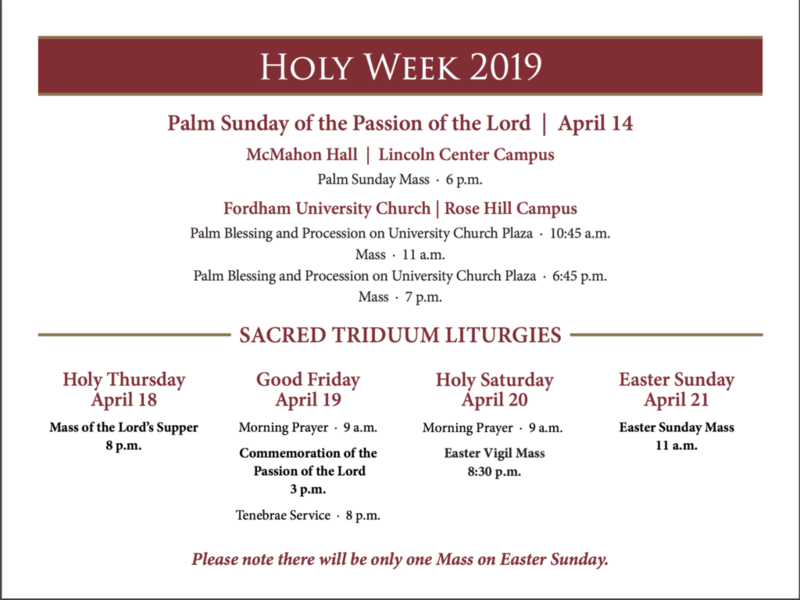 Because some students will have already left for Easter Break, however, we will also be holding a second, more formal service next week. It will most likely take place on Tuesday, April 23, but we are still in the process of coordinating details with important parties. So please look for an announcement coming soon about a service after the break. Of course, in times such as these, it’s natural to have a wide range of feelings, thoughts, and concerns. It’s important for us to be patient with ourselves and to take care of each other. Members of Campus Ministry, Counseling and Psychological Services, Members of the Faculty and Student Affairs are available to support you in any way they can. So please reach out to us! In the meantime, please be assured of our care and commitment to you, as well as our continued prayers. 6 PM | Workshop: Why Can’t Some People Immigrate Legally? Take a look at this short video from Busted Halo that explains what this “Lent” thing is all about! Join us for our annual Mardi Gras Party! Hope everyone enjoyed their breaks! We have an exciting semester lined up so keep an eye out for upcoming events and activities! Ignatian Family Teach-In for Justice 2018! Join Fordham/s Delegation at the Annual Ignatian Family Teach-In down in Washington DC. Visit our website here for more info and to register! Check out Fordham Senior Brian Harper’s thoughts on the crisis in the Catholic Church in his blog post in the National Catholic Reporter here. T-shirt Giveaway at both masses while supplies last! Comets, Craters, and Calendars: Clavius Distinguished Lecture featuring Paul Meuller, S.J.